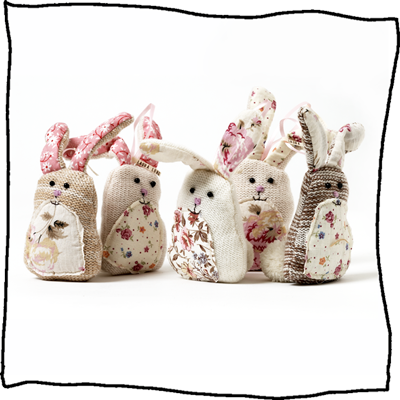 This charming little bunny will make the ideal gift or decoration any time of the year....a bunny is not just for Easter! Handmade using the finest lambs wool and embellished with vintage fabrics and a cute pompom tail. Initials can be embroidered on the stomach. Available with cream, light brown, pink or blue knitted bodies. Select your choice below and pop your initials into the text box if you want Laura to personalise your Little Bunny. Each bunny is beautifully presented in a gift box. Dimensions: Each bunny is approx. 14cms tall (not including ears).